The history of the Hawaiian or "Aloha Shirt" can be traced to the early western missionaries in the 19th century. They felt that it would be more appropriate, for the soon to be christianized natives, if they were covered. But the real fact is, that it wasn't until the mid 1930's that the Hawaiian shirt, as we know it today, started to be produced. Modern research discovers stories of a Waikiki, Honolulu, Chinese merchant, Mr. Ellery Chun, owner of King-Smith Clothiers and dry goods. Mr. Chun was born in Honolulu in 1909 and died June 16, 2000, at the age of 91. He is considered the pioneer of the Aloha Shirt. He and his sister, Ethel Chun Lum, fabricated the first brightly colored, floral, short-sleeved shirt from left-over kimono fabric. 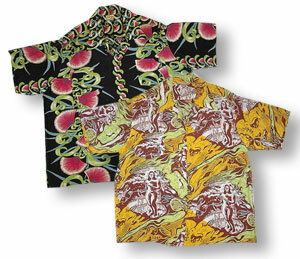 On July 15, 1936, Mr. Chun registered the "Aloha" trade name and began marketing a variety of Hawaiian-print shirts. The story goes on to tell of collaboration between a salesperson of the Honolulu Advertiser Newspaper and Mr. Chun to coin the phrase "Aloha Shirt". The future success of the Aloha Shirt was assured after placing one of his sister's designed, short-sleeved shirts in his shop�s window with a sign that read "Aloha Shirt". The shirts were purchased by local residents, beach boys, surfers and tourists. The first advertisement placed in the Honolulu Advertiser using the words "Aloha Shirt" was on June 28, 1935. With the birth of Rayon in the mid 1920's, the dazzlingly colored and tropically decorated Hawaiian-Print Aloha shirt became a staple souvenir of cruise ship tourists. Early shirt labels bore names like Musa Shiya, Watamulls, Kamehameha, Kahala, Surfriders, Alfred Shaheen, Duke Kahanamoku, etc. The 1940's and 1950's furnish us with a memorable list of ersonalities depicted wearing Hawaiian-Print Aloha Shirts. Elvis Presley, the undisputed king of rock and roll had many Hawaiian Shirts. Here is an off-the-top-of-my-head, recollection, list of famous people, motion picture and television personalities, politicians and sports celebrities that have been photographed and featured wearing Hawaiian-Print Aloha shirts. Harry S. Truman, our 33rd President loved to wear Aloha Shirts. He was on the cover of Life Magazine in 1951 wearing one. Montgomery Cliff and Frank Sinatra were featured in the memorable motion picture "From here to Eternity" in Hawaiian-Print Aloha shirts. The immortal John Wayne, "The Duke", and venerate master surfer and Olympian, Duke Kahanamuku were Hawaiian shirt endorsements. Bing Crosby wore his Aloha shirts, with his rounded, flat-top porkpie hat atop his head and a pipe between his lips. Arthur Godfrey, radio personality played his ukulele wearing an Aloha Shirt. Johnny Weissmuller remembered as Tarzan and Olympian, Tom Selleck of Magnum P.I., the list continues. All wore Hawaiian-Print Aloha shirts. And, who amongst us does not have a Hawaiian Print in our wardrobe closet? The Hawaiian-Print Aloha shirt has become a symbol of this island paradise; Hawaii. "Aloha", interprets to epitomize a warm sense of greeting, welcoming and at the same time reflecting all the playful, splendid and natural wonders that abound in Hawaiian Islands. Men's, Women's or Children's Aloha wear. The Aloha Shirt - a reprinted Aloha Shirt story of the "Hawaiian Aloha Shirt"